As a friend commented to me recently, I am a retracer – he means of my own paths. 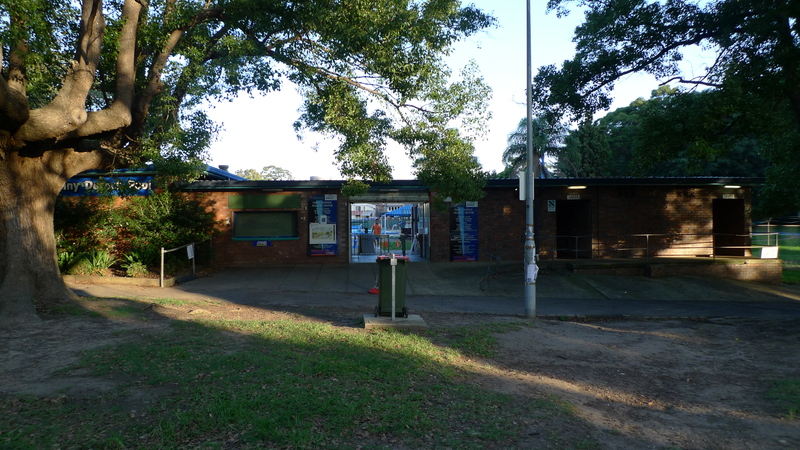 Recently, with a series of overcast weekends, I have been retracing my path to Petersham Pool, these days known as the Fanny Durack Aquatic Centre. The reason has been practical and sentimental. As to practical – it’s closer than the beach and on an overcast afternoon, nobody goes there. You can get a lane or sometimes even the whole pool to yourself. As to sentimental – for about ten years, from aetat 30 to 40, I lived opposite Petersham Park and swam at this pool regularly. Now the pool is to close for (they say) a year and a half, to be rebuilt. Certainly, the pool needs work, though I put a lot of that down to anticipatory neglect – the plan to rebuild has been in place since about 2004. Many of the tiles have lost their vitreous surface. It’s not clear that the filtration system is really up to the task – perhaps because in recent years the pool has also been heated. 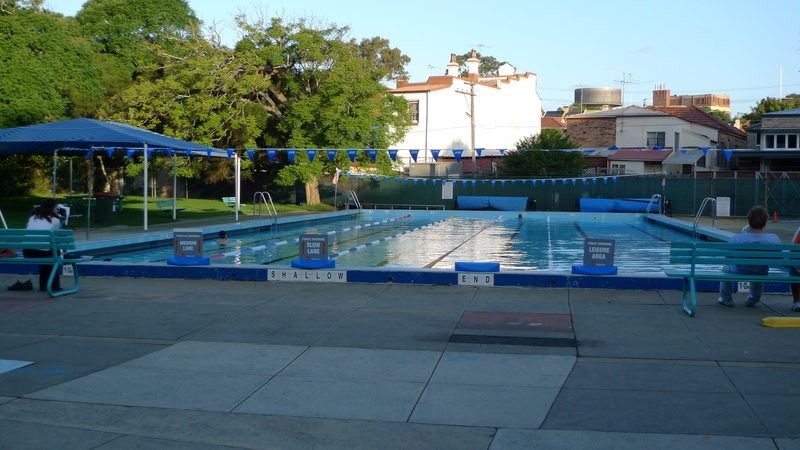 The pool is one of three pools built in Marrickville municipality in the early 60s. My half-remembered folk history is that agreement couldn’t be reached on where to put an Olympic pool, and as a result the area ended up with three 33 metre pools (more recently, I’ve learnt the Petersham Pool is in fact 35 yards). One, at Steel Park, closed some time in the 1990s. 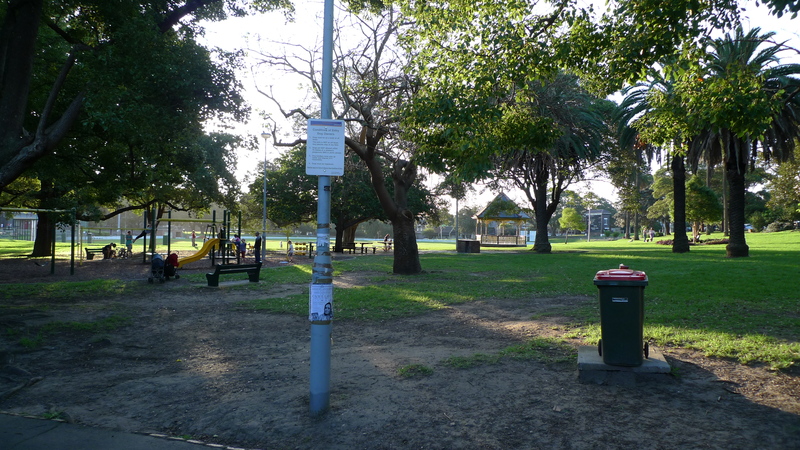 At that stage, the council was keen to close Petersham Pool as well and I got involved in one of the few grass-roots campaigns I have ever participated in – and even fewer which have been successful – to “save” it. The proposed renovation of the pool will see it replaced by a 25m pool. This strikes me as absolute idiocy. I’ve heard it suggested that this was to enable races to be held in the pool. Talk about the tail wagging the dog and the warped power of competitive sport! There would be very very few races ever held, whereas the shortening will have a real impact on the utility of the pool for its predominant use (apart from hot days) of lap swimming. 33 metres, or even 35 yards, is much better for getting a sustained rhythm up. The changing sheds have already been renovated. When heating was introduced (actually, I have very mixed feelings about this), we got hot showers. The last round of renovation saw two signs of the times, at least in the Gents.’ One is a nappy-changing table (and associated disposable-nappy bin). The other was that one bank of showers was enclosed into little changing sheds with doors. That is to me an unwelcome sign of the new prudery – call it modesty, if you will – which also seems to lie behind disparagement of the “budgie smuggler.” What exactly are we scared of? Gay men and pedophiles, I suppose, without much distinction between the categories. Both overblown fears in my opinion. To me, such changing rooms are a bit like gated communities. Doubtless they are in response to a desire expressed by some, but what do they say about us all? In due course, if you don’t go behind the door to shower you will be the weirdo, just as you will be if you wear Speedos. If that drew a crowd, the crowd had dispersed by the time I arrived. Any valedictory mood seemed quite restrained. After my swim, I took a few farewell shots of the pool – furtively, because of the new fearfulness, which is the reason for the wonky horizontal and the excess of foreground in the first picture. 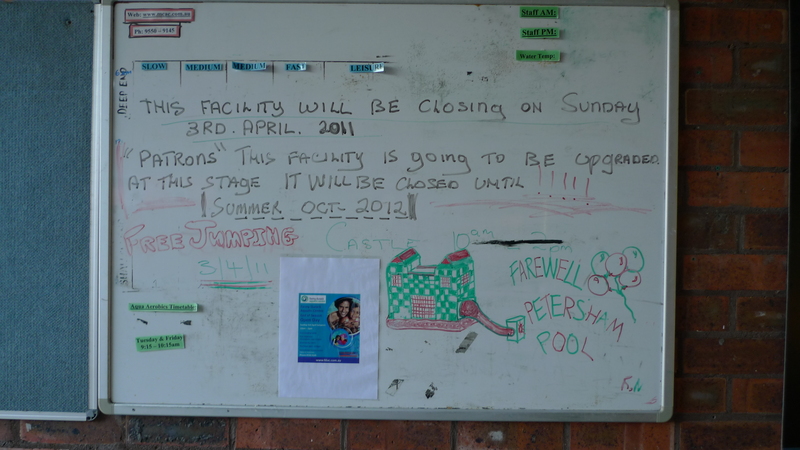 My nervousness in this regard was probably exaggerated because one thing Petersham Pool has never been is officious. The pool had maybe an hour’s opening time left, but I didn’t have the heart to wait for the dying moments. I took a final glimpse – the hardly grandiloquent front range seems likely to be demolished and replaced, including the toilets which serve the park. 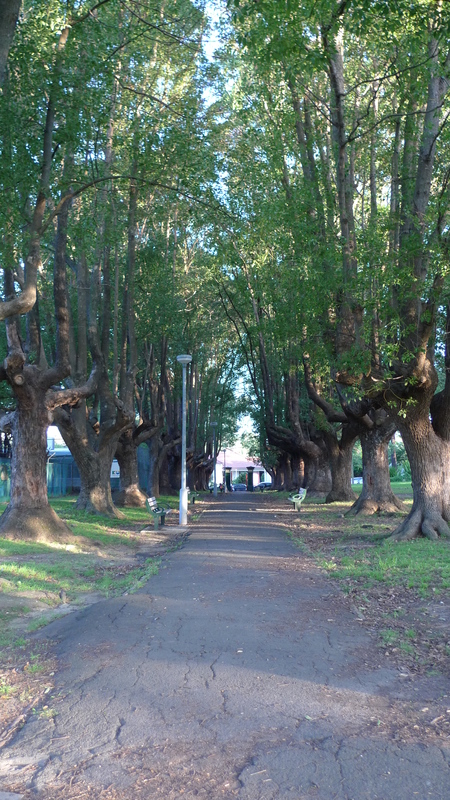 I left through Petersham Park. I walked up the (now somewhat neglected) pollarded avenue leading to the house where I lived for 10 years. Is it too groan-inducing to say it was a trip down (or rather, up) memory lane? The house I used to live in is up for auction. If you look very closely you can see the real estate agent’s billboard – it’s the brightish oblongoid to the right of the right gatepost. 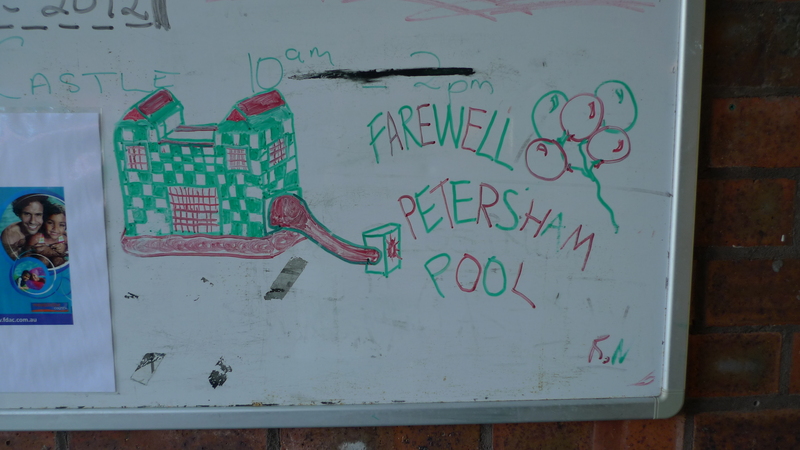 You are currently browsing the archives for the Petersham Pool category.